Richard Sr., who became licensed funeral directors. The Rocco family has promoted numerous civic activities, including the donation of cash scholarships to deserving students from local high schools for over twenty-five years. In 1992, the Rocco family presented a time capsule vault to the city of Everett in its centennial year and coordinated the collection of memorabilia from hundreds of area residents which will be unearthed in the year 2042. Also the funeral home has sponsored grief educational seminars as well as memorial masses for the community-at-large. These activities reflect on the funeral homes commitment to serve a community that has placed so much trust in it over the years. Our mission as the SALVATORE Rocco & Sons Funeral Homes, is to provide expert and compassionate care to all families at the time of their greatest need the death of their loved one. Our professional staff, comprehensive services and facilities are geared toward helping the bereaved cope with the loss throughout the course of their lives. The funeral home is currently co-owned by Richard S. Rocco Jr. and Stephen R. Rocco, both licensed funeral directors. Richard S. Rocco Jr. is a graduate of Stonehill College. He has served on the Advisory Board for the Archdiocese of Boston Cemetery Board. He is currently a Trustee of the Eagle Bank in Everett as well as member of the "E" Club of Everett (an athletic association which awards scholar-athletes with significant college aid). Richard is a Past President of the Italian American Association of Everett. He was also talk show host for an award winning community cable program entitled "Talk Of The Town". 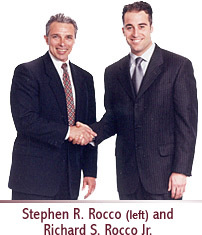 Stephen R. Rocco has a Masters degree in counseling from the University of Massachusetts. In addition to his duties at the funeral home he is a faculty member at Mount Ida College in Newton, Massachusetts teaching in their mortuary education program. He has written and spoken extensively about the funeral profession authoring over twenty nationally published articles. He is the former Co-Director of the National Center for Death at Mount Ida College, which houses the largest collection of grief and death related print and audio-visual material in the country. All of this material is available for the general publics use. Stephen recently completed a book outlining how funeral professionals can better respond to their communities needs regarding such issues as living wills, prearrangements, life insurance and referrals to counseling agencies.